On Christmas day we got the crew together and took a team picture. As you can see it was a tiring day for the gang. We actually hosted our first Christmas dinner for the doggies, family, and friends. The gathering was awesome, but it took all the energy out of me, Ali, and the doggies. Happy Holidays From The Doggies! Linus, Adelle, and Stetson would like to wish everyone a happy and safe holiday season. Thanks everyone for following our blog and we’ll see you in 2014! How did you spend your holidays? Did you have a few dressed up and festive pups? If so, we’d love to see a few pics! Me too! Plus we had a Christmas party on Sunday. It’s been a draining week. We’ll probably just crash out early on New Years Eve. Wow! 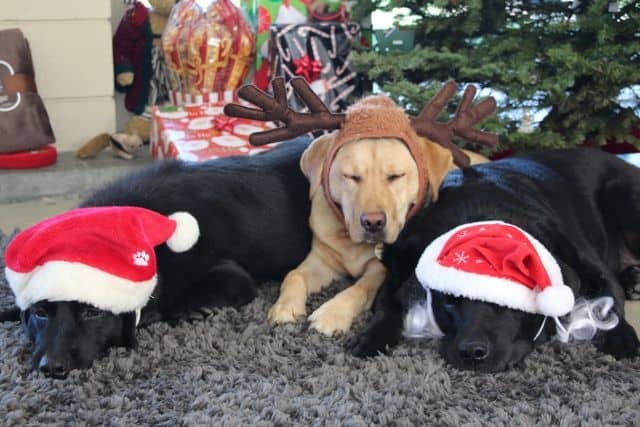 I’m impressed you managed to get not one…but THREE dogs to keep headgear on for this photo! Thanks! We work on putting different things (clothes, costumes, etc) on our dogs from the time they are pups. Since they’re being trained as service dogs they need to get used to wearing a harness/jacket as well as having their head, paws, ears, tail, etc handled by someone who is disabled or blind.